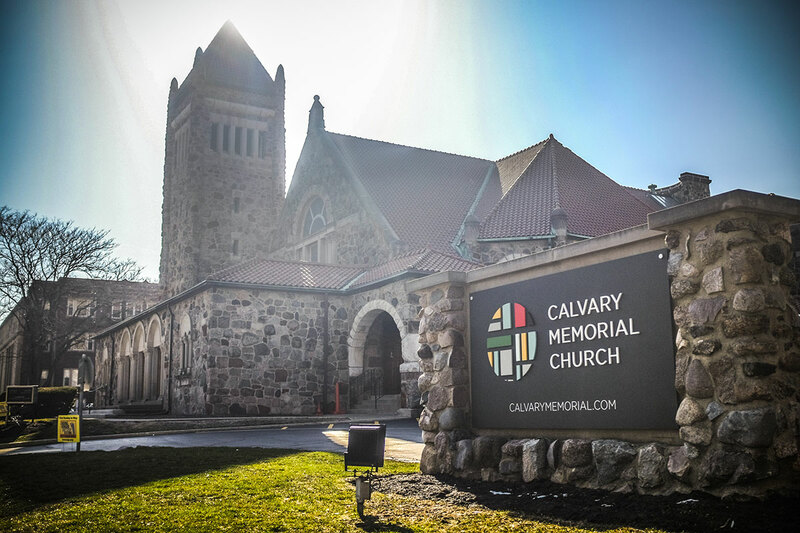 The Field School, a small private Christian school currently housed at Calvary Memorial Church in Oak Park, bought Key Elementary on the West Side for $125,000 as their new location. The district sold the shuttered school to them for $50,000 less than they originally bid since materials inside were stolen during a break-in last year. 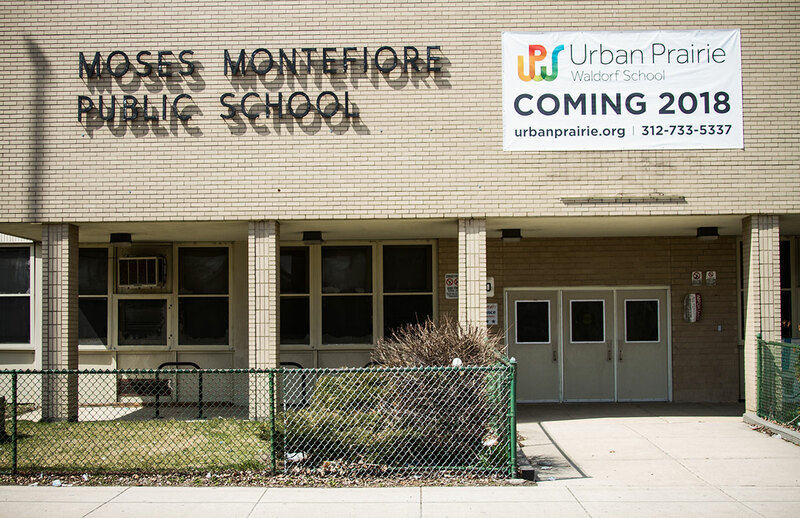 The Urban Prairie Waldorf School will open on the Near West Side in the former Moses Montefiore Specialty School, which was the last district-run elementary school meant for students with severe emotional and behavioral disabilities and was controversially emptied of students in 2015. The school was purchased for $2.1 million. 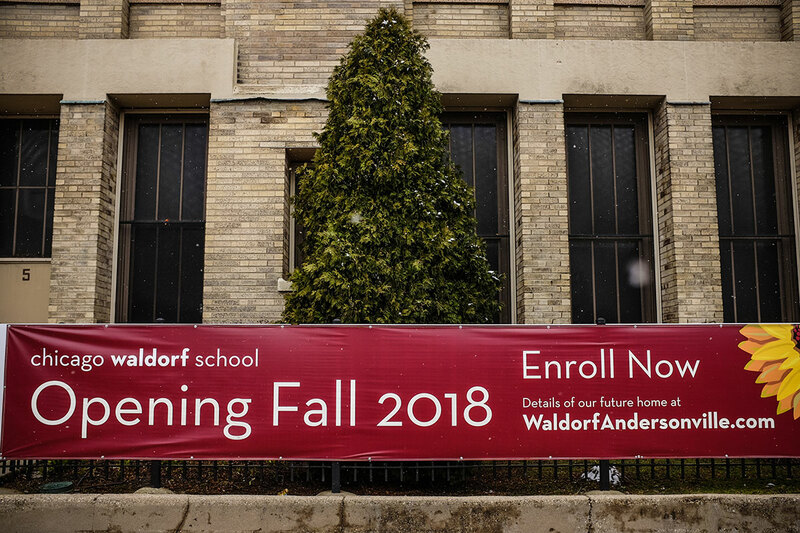 The elite Chicago Waldorf School is moving into the shuttered Trumbull Elementary in Andersonville. 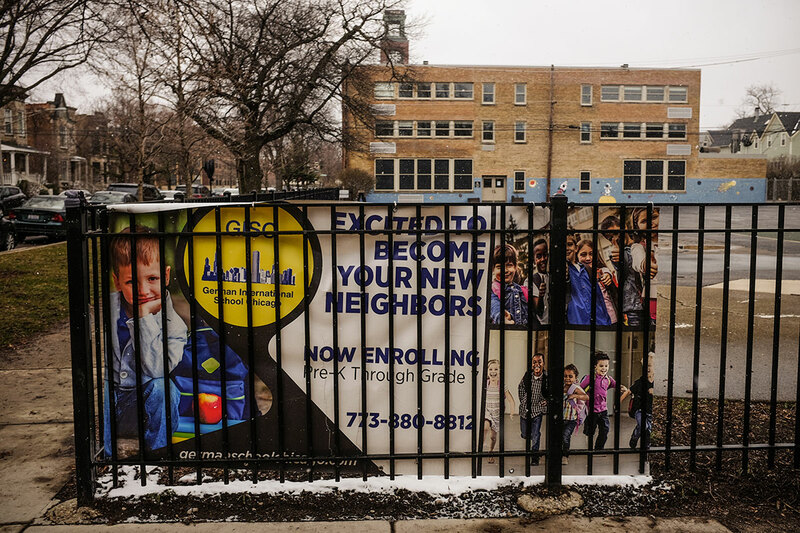 The plans of the developer who initially bought the property from Chicago Public Schools fell through so it resold the school to the second-highest bidder, Chicago Waldorf. CPS had written in the deed that the building could become a private school, enabling the resale. The German International School is relocating a few blocks to the former Courtenay School building, which sits on the same block as Mayor Rahm Emanuel’s home in Lake View. In selling the closed school for $5.3 million, the district stipulated that the property cannot be repurposed as a charter school. When Chicago Public Schools closed an unprecedented 50 schools five years ago, officials repeatedly promised that the empty buildings wouldn’t go to charter schools. The move appeased critics who said charter school growth contributed to enrollment declines and budget cuts in neighborhood schools, making them targets for closure. Since the shutdowns, nearly every closed school that has been sold carries a permanent deed restriction saying the building can never become a charter, even if it’s resold on the private market. But as districtwide enrollment falls and public opposition has slowed charter growth to a trickle, public schools face a new threat: private schools are moving into the vacant CPS buildings and threatening to take public school students with them. Over the past year, four private school operators have purchased closed school buildings. All of them say they hope to benefit from the state’s new $75 million tax-credit scholarship program, which makes a private education free for many low-income families. And more sales could happen, as another 14 vacant schools without restrictions on becoming private schools are awaiting buyers. While more than 20 schools vacated due to the 2013 closings have sold to private developers and nonprofits for non-educational purposes, the sale of four schools in one year to private school operators is striking. (CPS sold three schools, while a private developer resold the fourth.) The Chicago Reporter reviewed CPS real-estate transactions going back to 2001 and found no other instances of sales to K-12 private schools and just one long-term lease. The sales have happened with little public notice or opposition, even from the district’s usually outspoken teachers union, which railed against putting charters in closed schools. While the union opposes using public money to fund private education, it hasn’t put up the same fight over private schools moving in. They’ve been waging other battles, officials say, like opposing a plan to open a controversial charter school in a neighborhood high school. Still, Jesse Sharkey, the vice president of the Chicago Teachers Union, says the district shouldn’t approve sales that could undermine public schools and students. “I think it’s extremely problematic to close public schools and turn buildings over to essentially what are competitors to the public school system,” he said. Who is buying up closed schools in Chicago? Staff from the Urban Prairie Waldorf School were surprised to find student belongings, like coats, artwork and trophies left behind after Montefiore, a school for students with profound disabilities, closed in 2016. “It was like someone pulled the fire alarm and never came back,” one staff member said. What’s happening in Chicago reflects a national trend as champions of school choice, like President Trump’s Secretary of Education Betsy DeVos, favor spending public dollars on private education. While the charter market is saturated in cities like Chicago — prompting some charter backers to stop spending money here — school-choice funders have shifted their attention to private school growth. And private operators, including some that previously ran charters, are looking for buildings for this expansion. In Chicago, half a dozen private schools have submitted unsuccessful bids for closed public schools in recent years. Some school-choice supporters say it’s wasteful to spend millions of taxpayer dollars to maintain empty public schools, as Chicago has if charter or private school operators want them. “If you asked a parent: ‘Would you rather have this empty building around the corner that’s going to attract vandals, or a quality education option that you may or may not use?’ To me that seems pretty self-evident what a family would say,” said Jonathan Butcher, who analyzes education policy for The Heritage Foundation, a conservative Washington, D.C. think tank that advocates for the expansion of school-choice programs. Private school operators say it makes financial sense to move into closed CPS schools. They’re affordable and need few renovations because they’re already set up to educate students. But Andrew Broy of the Illinois Network of Charter Schools says it’s unfair that private schools are allowed to buy these buildings while charters struggle to find adequate facilities with gyms, cafeterias and auditoriums. Charters often shell out to private landlords or go into debt to build new schools, which reduces how much they can spend in the classroom. “Why [don’t charter] students have access to suitable, safe, publicly financed buildings and others do?” he asked. The private school operators run the gamut from the well-established to start-ups. The elite 44-year-old Chicago Waldorf School is relocating from Rogers Park to the former Trumbull school in Andersonville. Meanwhile, the German International School is moving a few blocks away from its current home in Lake View to the former Courtenay school, half a block from Mayor Rahm Emanuel’s home. The Urban Prairie Waldorf School will open on the Near West Side in the former Montefiore building, which CPS quietly closed in 2016 after sending its special-needs students to other schools. 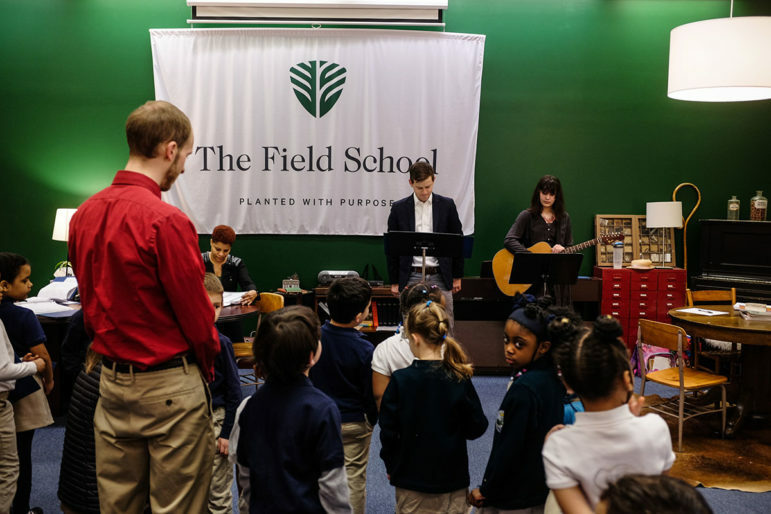 The year-old Field School will relocate from its temporary space in an Oak Park church to the former Key building in Austin. All four plan to expand in their new, larger facilities and hope to attract families from the surrounding area. The Field School, for example, gives preferential admission to families from Austin. The German International School director said she saw an uptick in preschool applications from nearby families after their banners went up. And Chicago Waldorf leaders chose their new building in part because they determined the area had more school-aged children than their previous location. Urban Prairie officials hope to attract parents who work in the nearby Illinois Medical District. School leaders are aware the optics of moving into a closed CPS school aren’t great. But they say they’re taking steps to make the buildings open to the public again by letting neighborhood kids play on the grounds after school or offering low-cost programs, such as summer camps and art classes. Despite that outreach, some residents in communities where private schools are opening complain that they had little say in the decision. Aldermen held several community meetings to ensure residents living near the two closed North Side schools were on board with private schools moving in. But no meetings were held for the two shuttered West Side schools that were purchased by private school operators. Ald. Jason Ervin, 28th Ward, says Urban Prairie got buy-in from the Illinois Medical District Commission but a community meeting wasn’t necessary because few people live near the school. The area is experiencing rapid change following the demolition of public housing and the construction of a huge new mixed-income development. In Austin, 29th Ward Ald. Chris Taliaferro says he asked The Field School to hold a community meeting, but that never happened. Instead, school officials submitted 18 letters of support from residents and people who work on the West Side and promised to hold a meeting in the future. The Key sale has raised some eyebrows in Austin, a predominantly black neighborhood that was hit hard by school closures and has struggled to maintain enrollment. Even its top-rated public schools are losing students as charter and private schools have opened and families have left the neighborhood. The Field School bought Key earlier this year for $125,000. The private Christian school reserves half its seats for low-income students and offers them substantial financial aid. It attracts families from both the West Side and suburbs like Oak Park. The school has only 44 students, but its founder Jeremy Mann aspires to one day enroll up to 350 students from preschool to 8th grade. He intends to pay fr this through private fundraising, but knows the state’s tax-credit scholarship could help. He’s seen a similar approach work elsewhere. His school is modeled after a thriving Indianapolis private school that’s grown from one to three campuses as Indiana’s school voucher program made more public dollars available for private schools. Even though Austin is losing families, Mann insists the neighborhood can sustain another school. He’s a school-choice advocate who formerly oversaw special education teachers at Chicago’s office of Teach for America, which places educators in struggling schools but has been controversial because its teacher-prep program is shorter than a traditional one. Mann sees demand for his school’s unique offering: a racially and economically diverse student body that wouldn’t otherwise exist in a segregated black neighborhood. He and his wife, a nurse practitioner at Lawndale Christian Health Center, live in Austin and plan to send their young children to the school once they’re old enough. “I think different educational options can actually bring greater health [to a community] and they don’t have to be viewed solely as competitive with one another,” he said. He may not see it as competition, but when parents weigh their school options, it can become one. Austin parent Marisha Vance sent her daughter to her neighborhood’s public school, Key, until it closed in 2013. She didn’t like the other nearby options, and since then she’s sent her two children to charter and private schools. Looking for smaller class sizes, Vance enrolled her first-grade son at The Field School this year and was happy to hear it would move into Key, the school she attended as a child. Vance is a single mother, so it’s a sacrifice to pay for her son’s tuition out of pocket, even with the help of financial aid. So when a co-worker told her about the state’s new tax-credit scholarships, she knew she’d apply for one as soon as her son’s private school is eligible to accept it. “I could put that [savings] toward college for my daughter,” she said. Lawmakers ushered in the state’s new tax-credit scholarship program when they passed historic school funding reform last year. The program works like this: Individuals and businesses give money to organizations that grant scholarships to families. For every dollar they donate, they reduce their income taxes by 75 cents, so money that would normally fund the state’s budget goes to pay for private-school tuition. Three of the private schools that purchased closed CPS schools say they’re going through the state-vetting process so they can accept tax-credit scholarships; one already has. The scholarships are worth nearly $13,000 a year for a low-income family, which would make tuition free or significantly more affordable. Scholarships are still being awarded, but families will know in the coming weeks if they’ve been chosen. At least 6,000 students are expected to receive scholarships this year. The program prioritizes low-income students and kids from low-performing districts like CPS. 40th Ward Ald. Pat O’Connor, the mayor’s powerful floor leader, said he wasn’t thinking of private schools as competition against his neighborhood’s public schools when his ward debated what to do with the closed Trumbull school. But that was before the state’s tax-credit scholarships were created. It’s unclear how many students who applied for a tax-credit scholarship are currently enrolled in public schools. Myles Mendoza, who directs Empower Illinois, the influential scholarship-granting organization that helped lobby for the program, says the application doesn’t ask for this information. But other states with similar programs have attracted a significant number of public school students. In Florida, for example, just under one-third of tax-credit scholarship recipients used to attend public schools, while almost half started in kindergarten, many of whom likely would have otherwise attended public school. Illinois’ tax-credit scholarship program is still relatively small and by itself won’t lead to a major expansion of private schools. But some opponents worry it opens the door to spending more public money on private education. Mendoza, for example, says there’s interest in creating a similar program for Illinois preschoolers. In other states, tax-credit scholarships and voucher programs have taken off in recent years. And though some hope Illinois’ program is temporary, proponents say legislators are unlikely to reverse it once they see how many families want in. Already, demand far outstrips the supply of scholarships. Empower Illinois, the largest of the nine groups that give out scholarships, received some 48,000 applications. And if it’s any indicator of the potential for future growth, private investors say they’re closely watching from the sidelines. John Eriksen, who co-founded a Milwaukee-based fund that gives money to private schools to help them expand, says he is “keenly interested in Illinois.” He would consider investing here if the tax-credit scholarship program does well after its first year. There’s promise, he says, because the scholarships are large and donors get a big return on investment. “They have a damn good start,” he said. Posted in Charter School, Failing Schools, School Choice, School Closings and tagged "Standing Strong for Public Education", #iBelieve, Accountability, Accountability System, Advocacy, Department of Education, Diversity, Education, Education Funding, Equity, Every Student Succeeds Act (ESSA), Failing Schools, Federal Education Policy, High-Needs Students, NEAExecutiveCommittee, Public Education, School Choice, Students. Bookmark the permalink.